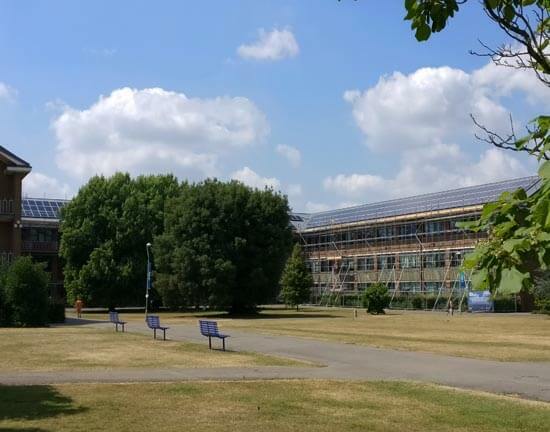 Reading University have just completed the installation of 168 kW of solar PV across their main campus, and due to a peculiarity of the site, have installed this subsidy free – that is to say without the use of any feed-in tariff support. Extensions to solar PV systems do not qualify for feed-in tariffs, and with the whole of the campus on one supply, any new PV systems do not qualify for support due to the presence of an existing array on site. That left Reading University with a choice – install PV without subsidy, or not to install at all. Reading University did indeed install, as the economic case for them was still strong. As such, this project forms an exemplar for future commercial solar installations once the feed-in tariff is removed in April 2019. The scheme focussed on 2 building on the main campus. The Edith Morley building is the largest building on site, and centrally located. At 124 kW, this gave good economics due to its scale, and also acted as a very public statement of the University’s drive towards a low carbon campus. The second building – the Wager building – offered a different opportunity. 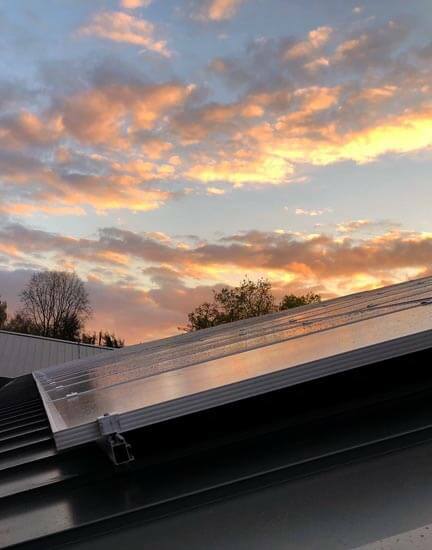 The roof was being replaced, and so it made sense to install 44 kW solar PV at the same time as these other roof-works. With scaffolding typically making up 10% of the cost of a commercial solar installation, there is an immediate cost saving for running the 2 works concurrently. Again, this is a good guide for those considering solar PV projects in a subsidy free environment– cost savings from sharing scaffolding like this can offset the lack of feed-in tariff income. Reading University have an ambitious carbon reduction programme of 45% by 2021, and are already ahead of target. However, the simpler measures, typically energy efficiency, have already been carried out. By addressing the ‘low-hanging fruit’ in early years, solar PV now makes increasing sense as one of the next set of measures. It’s a very good technology for a 2nd wave of energy retrofits, as deep carbon reductions require moving beyond energy efficiency and looking at generation technologies as well. The Edith Morley Building, for example, gave rates of return on investment of 12% even without feed-in tariffs, which equates to an eight year payback. Reading University considered this a financially attractive option for meeting their carbon targets. The most complex aspect of the project was coordinating the works on site. All roof works had to be completed in the summer holidays, and the PV had to follow after the re-roofing works were complete. This required careful and flexible project management in order to take advantage of the opportunity. 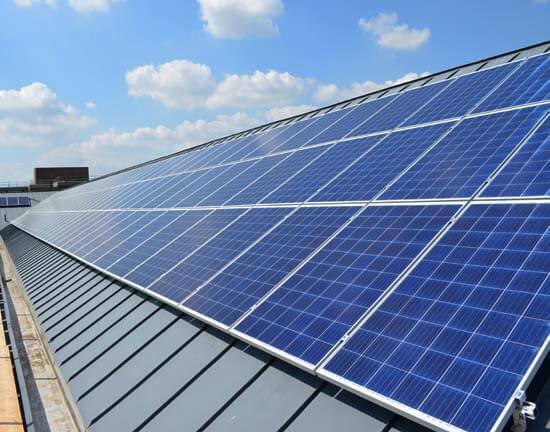 Reading University have indicated that when they are reroofing other buildings they will look to incorporate solar at the same time. This approach of sharing scaffolding costs across 2 pieces of roof work is something Joju Solar are very experienced at, and one we commonly use in our work on solar schools. Public space, where a clear statement about green activities can be projected.